There are some oddball niche lines out there, but it's hard to imagine any other mainstream brand the size of Lush — much less a mall chain the size of Lush (over 900 stores) — launching a fragrance collection under the name Death, Decay and Renewal. The individual fragrance descriptions emphasize the renewal part as much as the death and decay part (the collection is "inspired by the cyclical nature of life", and do watch out for that ear worm), but still, it would be a surprise from anybody else. Verdict: Nicely done and worth a try for white floral fans, but not, for me, a must have. I'd certainly wear it if I had a bottle, but the bottle I have came from Lush so I'll be giving it away, along with Kerbside Violet and All Good Things — watch for a contest early next week. If anyone has tried any of the others in the series, do comment! An aside: I'll add that every time I wore Death & Decay, I wished that Lush would do a Ylang Jam shower gel to match Rose Jam (they've already got Flying Fox for a jasmine jam). Lush Death & Decay is currently available in 30 ml (£30) or in a 12 g solid (£8). It can be found in the UK and other countries but not, as of yet, the US. The bottle shown above is neither of those (the 30 ml size is a dropper bottle, thinner than that, and with a different top) so perhaps more sizes are to come? 1. The others are Smuggler's Soul, Kerbside Violet, All Good Things, Dad's Garden Lemon Tree, The President's Hat, Stayin' Alive, Princess Cottongrass and Dad's Garden - Chamomile And Honeysuckle. 2. The first part: "The pure scent of lily mingles with over-ripe tones of indole to give this fragrance a pungent, narcotic headiness." Via Lush UK. 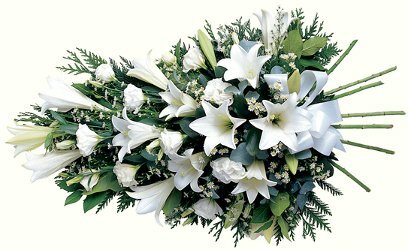 Note: top image is White oriental and mixed floral sheath to sit on coffin via Swanborough Funerals. A couple of Saturdays ago, we had the first nice day since October, and I paid a visit to the outdoor mall. Stopped in Lush for the first time ever. It’s quite a small space here–and was teeming with throngs of women in the throes of spring fever. Had to leave immediately! I’d be more inclined to blind buy one of their shower gels if the packaging appealed to me. That said, their fragrances sound intriguing. Lush is not always the most fun store to visit, I agree, but in their favor, they’re generous with information and samples (they’ll cheerfully do up a sample of almost anything). I have not loved all the shower gels so would not buy unsniffed, esp. given the price ! Still no word on a release date? Bummer. I’m getting really impatient to try Smugglers Soul. Can we expect a review for Kerbside Violet? I picked up their LE Ultraviolet Bubble Bar and it is amazingly good. I have not tried to find out, since I rarely have much luck finding things out from Lush. I’m just assuming they’ll get here eventually. I guess that’s the caveat about the 900 stores — they don’t release everything in every store, and the perfume distribution is esp. sparse. Will have very short reviews of Kerbside Violet and All Good Things next week. I want to try Smuggler’s Soul too, and President’s Hat. Why oh why do they insist on using dropper bottles? Who even likes dropper bottles? Good to know it’s full bottle worthy, even if not in that particular packaging. I don’t like the droppers either. I’ve sampled this twice, lured by the name. D&D is a very innocent girlish lily-of-the-valley on me before it fades. I don’t get the concept of death and/or decay at all, more’s the pity . . .
Well that is interesting — I don’t get any lily of the valley! O death, where is thy banana-jam? If I’m going to have an earworm, the alto-tenor duet from Messiah is one I don’t mind. Thanks for that, and for the laugh. This made me spew tea! Thanks for the laugh. Aveeno’s Stress Relief Moisturising Lotion is scented with lavender, chamomile and ylang. To me it smells quite strongly of banana jam. I think there may be a body wash as well. I doubt it would it have the intensity of Lush shower gels though! I will have to give it a sniff, thanks! I tend to like the concepts of Lush fragrances better than the fragrances themselves, but I seriously appreciate what they’re doing. This one seems like something I’d enjoy, so I’ll seek it out. And Princess Cottongrass sounds nice for spring. Oh, shoot, that makes another one for the must-try list. I have been in deep love with ylang lately. I thought I loved white flowers, but it’s the yellow ones that to get to me. Out of left field, I sampled Demeter’s Funeral Home and Flower Show last week. There is a bit of something that smells of decay in both of them. I seriously love that something, whatever it is. Thank you for the review. Can’t wait for this fragrance collection to arrive in the US. Erin did an article on ylang ylang, do check the comments, there are lots of other recs! Super suggestion to check out Erin’s ylang ylang article. Thank you. I love Vanille Galante, which is on Erin’s list, and Songes, which is the first suggestion in the comments. Now I’ve got some sampling to do . . .
I’ll give them a point for concept and packaging, although I doubt I’ll try this not being a big white floral fan (love to smell them live in a vase, but not to wear [except jasmine]). I always enjoy your reviews, Robin. And you are always so nice to say so!